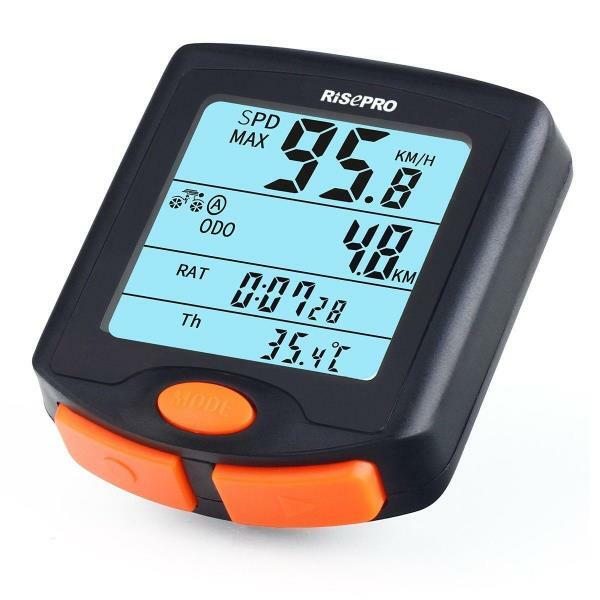 LARGE & CLEAR 4 LINES DISPLAY – RISEPRO® Bike Computer offers you a large & clear 4 lines display. 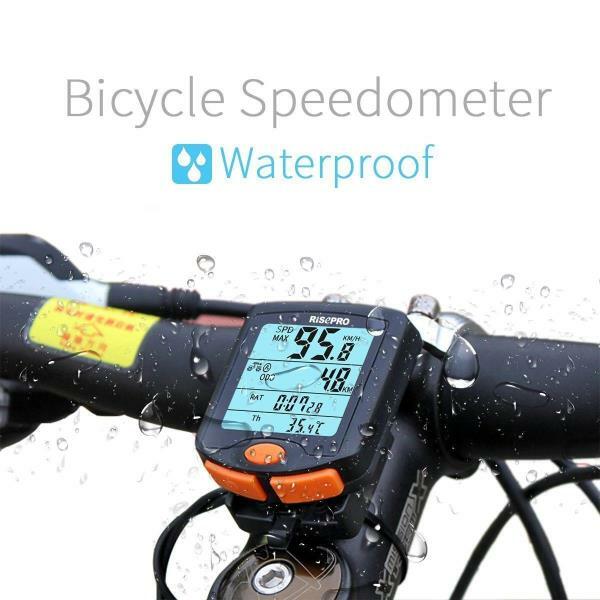 Easily and clearly view your cycling data at a glance! 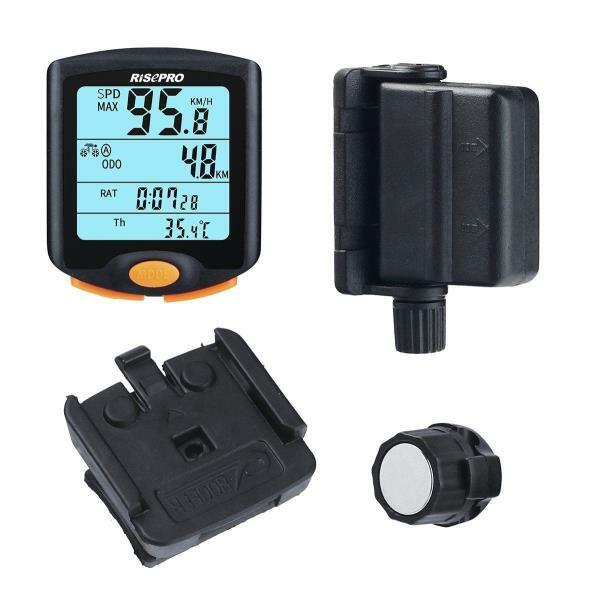 TWO BIKES SETTINGS & DATA COMPARISON – This newest model allows you to pre-program all settings for two bikes (Bike A and Bike B). No more re-setting between 2 bikes! 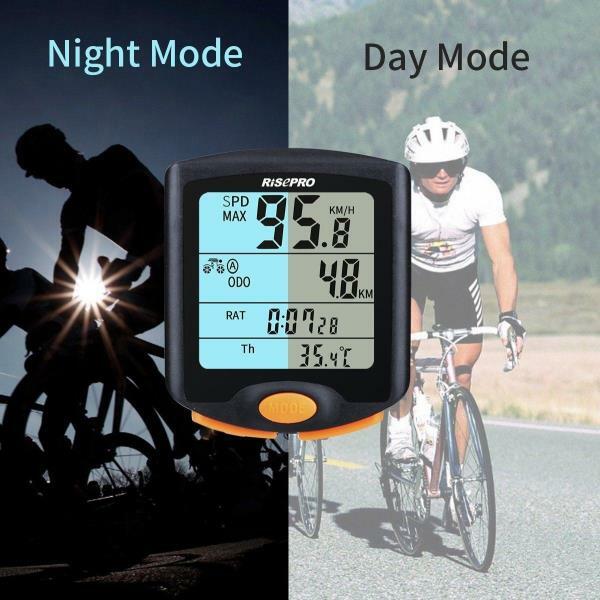 Great for comparing recorded data between Bike A & Bike B for training and other purposes! 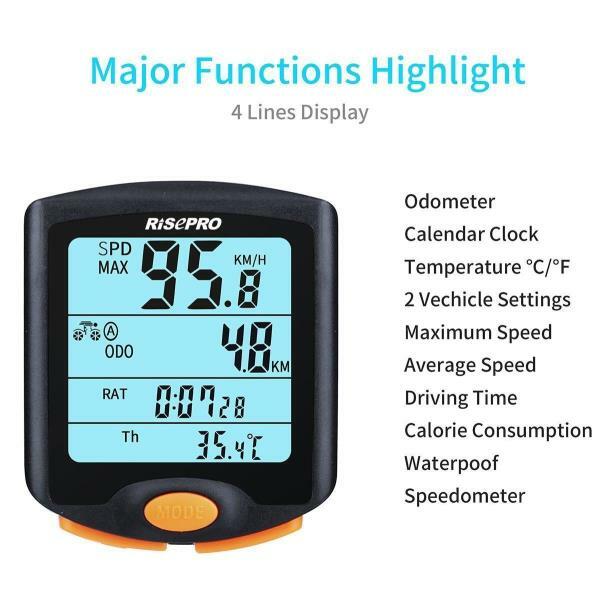 MULTI UNIQUE & USEFUL FUNCTIONS – Typical functions highlight: Odometer, Maximum Speed, Average Speed, Driving Time, Calorie Consumption, Speedometer and etc. 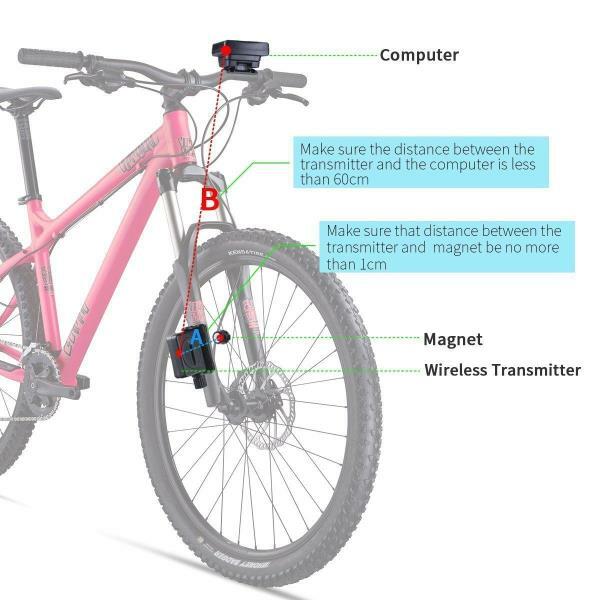 RECEPTION RANGE & COMPATIBILITY – 60cm range between Bike Computer & Transmitter ; 1cm range between Transmitter & Magnet. 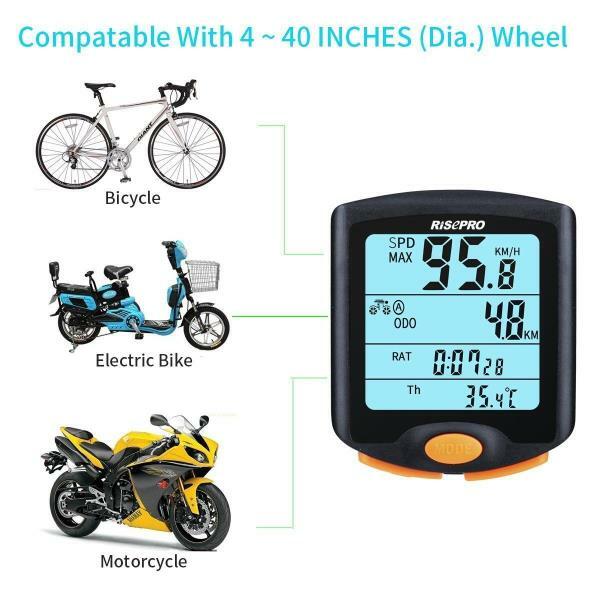 Compatible with bikes, electric bikes and motorcycle with 4 – 40 inches wheel. 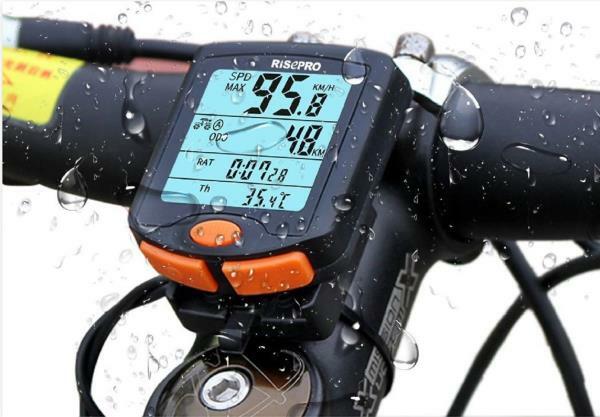 BACKLIGHT & WATERPROOF – This advance cycling computer is designed with backlight for night riding and waterproof against raining and wet condition. Works anytime and any weather! 1. Our goal is to provide the best customer service. All enquiries are answered within 24 hours and our friendly customer service team aims to unravel any issues quickly and effectively. 2. We will be able to provide you with free & fast delivery. Your order would be shipped out within 1 business day and to your doorstep aside from oversized items. 3. We are at all times here to help the best conceivable way we will. We are constanly improving our services and hope you’re going to keep coming back. We use different suppliers across the US to ensure your item is delivered as fast as conceivable. We provide FREE SHIPPING within the Continental United States. Currently we do not process orders to Alaska, Hawaii, Puerto Rico, PO Box, APO/FPO. We need to ensure all our buyers are offered all the benefits that eBay has to offer. We require immediate payment in order to ensure all our customers have equal access to our inventory.